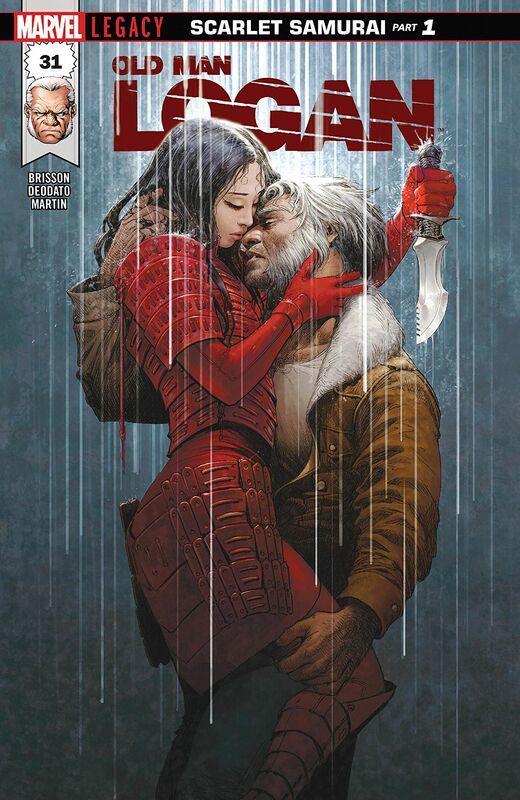 Friends and foes, both past and present return as the adventures of Marvel Comics grizzled time-displaced alternative dimension version of Logan continues with Scarlet Samurai Part 1, the brand new story arc from writer Ed Brisson, artist Mike Deodato JR, and colorist Frank Martin. Following his run in with the Maestro and the Hulk gang in Canada, Logan’s travels bring him back to Kabukicho, in Tokyo, where his reminiscing about this place he once called home briefly eclipses Logan’s apocalyptic future in the Wastelands. Violent action, drama, and brooding intrigue permeate every aspect of Ed Brisson’s tautly woven scrip as Old Man Logan’s momentary peace is shattered by a brawl with henchmen from the Crazy Thunder Clan empowered by a new drug that gives them uncanny regenerative abilities. You can’t have a slug-fest like this in Tokyo without the Silver Samurai being involved somehow, and sure enough the Yashida Corporation developed the drug, Regenix, and the mystery of who has been supplying it to the Crazy Thunder Clan is soon ruthlessly uncovered. From the shadowy, neon lit side streets, to the gleaming vista of the Tokyo skyline, the fantastic work of artist Mike Deodato and colorist Frank Martin effortlessly brings the various locales featured in this issue to life. Dedato’s trademark open-panel style and dramatic use of perspective places you right in the thick of the action. Every scene feel larger than life, especially when Logan tracks down the Crazy Thunder Clan, and the battle which follows – just like their earlier confrontation – is a blood splattered collage of visceral action and severed limbs as Logan’s berserker rage kicks into high gear! Frank Martin’s colors accentuate the action perfectly, with urban grey tones contrasting beautifully with the shiny modern hues of Yashida Corp, while the brutal violence and unflinching detail jostles with ominous shadows amidst the crimson carnage. As the issue races towards its devastating high-rise cliff-hanger, Logan makes a fortuitous discovery, Gorgon – who has also led the Hand into battle against Wolverine in the past – makes his move, and the Scarlet Samurai finally steps into the fray! From the moment you see that gorgeous cover by Mukesh Singh, you just know that you are in for something special with this issue of Old Man Logan. The first part of this new saga is a real scene setter. There’s plenty here for long term fans to enjoy, but this issue is also a great jumping on point for new readers too (especially as it also features a brief recap of Old Man Logan’s back story by Robbie Thompson, Andrea Sorrentino, Lee Loughridge). The Tokyo setting is impressively realized, the plot moves along at a blistering pace, and the mystery surrounding the Scarlet Samurai will no doubt prove an intriguing and bloody one for Logan to solve. The creative team of Ed Brisson, Mike Deodato, and Frank Martin are really hitting their stride now, this series continues to go from strength to strength, and Old Man Logan # 31 gets this new story-arc off to a great start! Really loved this issue. Like where this is headed, especially with the new villain. Great review Paul, your enthusiasm for this series is certainly infectious – I now have the first four volumes ready to read and look forward to catching up to the current run form Brisson/Deodato Jr! Incredible review, sir. I have seen you around Chris Evans post quite often but somehow managed to not check out what your own content was about. I’m absolutely stunned that there was another fellow fan of everything geeky out there (consider me your new follower). While I have to admit I’m a very Bat-centric reader with the occasional graphic novel classics or indie comic reader, I do hope to plunge myself in some of Marvel’s runs some day and Old Man Logan (at least the original story by Mark Millar) is definitely on my list. It’s nice to hear this run is just as amazing though.